In life, especially in these time, "they" say, we are exposed to so much information. So many things and people and places and events and all we can do is grasp as they fly by, then intentionally or accidentally grab the things which interest us or which catch our eye. It is impossible, I believe, to "get" everything. Sometimes on a road trip I do a similar process. There is so much that flies by from the car, so much to look at and if we stopped to explore everything we would never get "there." Maybe someday we will take a road trip which is just that and there will be no there there. But there was a there, a destination, a place we had to be and a time. So, sometimes, yes while driving, due to the ease of digital photographs, I snap pictures while I drive. Don't panic. I don't look at the pictures I'm taking. See, I remember using rolls of film in a camera and counting the frames, and knowing that sometimes you could squeeze in an extra picture or two. But it required two hands, point, (focus, sometimes), click, advance the film. And then you had to develop the film. Some people still do this and I love that. But developing the film cost money and there was a limit and so each shot counted - most of the time. But with my phone all I have to do is press the home page icon which is the bottom left corner of the screen so I don't even have to look and then I hold it up to the open window and click click click - my phone has all alerts off so I don't even get that - it's just a bunch of tapping the screen, a bunch of times. Then, when we get to the next break (usually a rest stop, or lunch, or gas) I go back to the photos and weed them out, keep the ones I really like. Like this one. A few years ago I took one of these side view mirror photos while driving. It was a sharp contrast of what was behind us and beside/in front of us. I thought it was cool. So I've started taking more of these click-it no-focus in front and behind mirror shots when driving through interesting places (or when stopped at interesting places and something catches my eye). 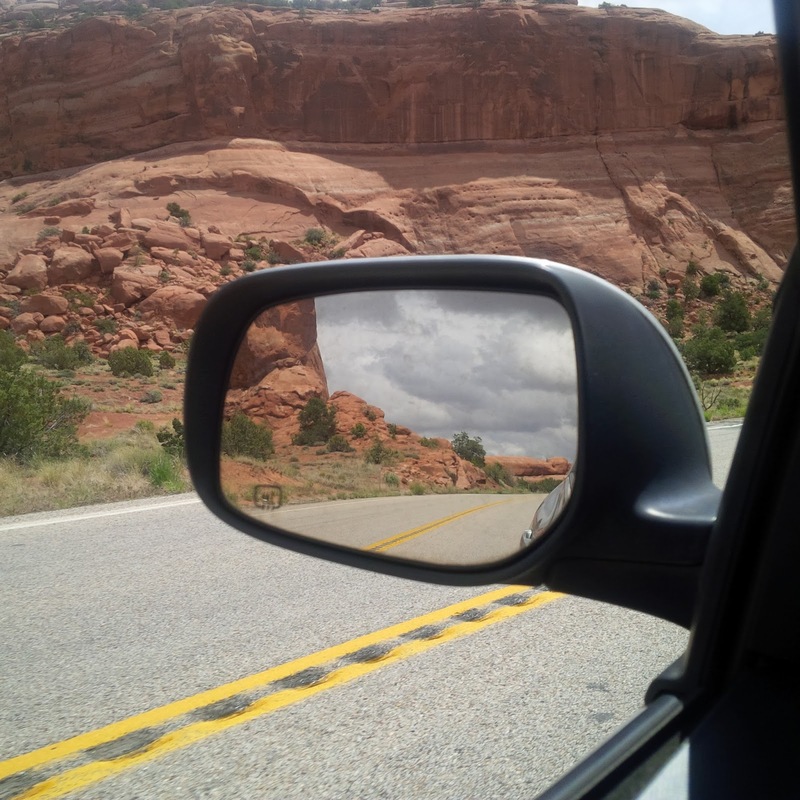 This was while driving near Canyonlands in Utah. The view from the road is spectacular. One of these days we'll build in time to actually go into the park. Maybe.